Social media access is going to change with the practical use of wearable technology and your business will have to adjust to reach the right audience. The debut of the Apple Watch in April is just one of many releases of wearable technology. Intel, Samsung, and Motorola have already put their smart watches on the market, unleashing a whole new era of mobile capabilities for the consumer. 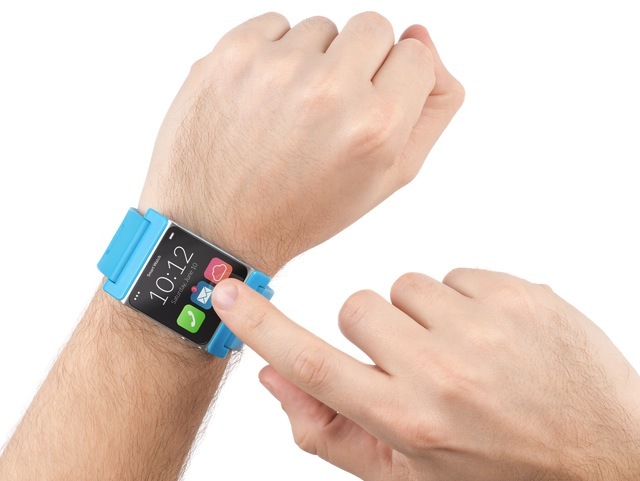 These smart watches will enable the wearer to conduct basic functions as if they were using their smart phone. GPS location services, receiving “tap” alerts from incoming messages, accelerated app access, and virtual wallets are all aspects of mobile devices that change how social media advertisements will reach and affect the consumer. Wearable technology will alter how customers receive media messages because the screens for these smart devices are much smaller (about 42 mm) than a typical smart phone or tablet. The decrease in size limits the amount of information the user can comfortably observe and makes marketers work to have their message read effectively. Banner and pay-per-click ads could become obsolete due to the change in screen size and difference in interface, so branching out to more user friendly media is key. But using wearable technology opens up a new conundrum for advertisers: how do you reach a consumer who is more receptive, but simultaneously more limited? Because of the shift in accessibility, businesses will have to change their methods for creating memorable social media content. One strategy is to use the location services smart watches offer that other devices do not, like immediate offers based on GPS location. Anyone wearing a smart watch who checks into your business using Facebook or Twitter could receive an alert that they’ve activated an instant discount upon their arrival. By giving incentives to someone who tags your business, you expand your visibility to all of their friends and followers on any social media platform. This keeps the brand relevant, makes the customer feel appreciated with exclusive deals, and makes a statement that your business is the place to go. Some wearable devices also allow you to store your movie or plane tickets on your watch, as well as loyalty cards for local businesses. These “frequent flyer” style points can also be used to communicate with the wearer. Businesses will be able to send reminders when people have accrued a certain amount of points. Making these points transferable could help create new business and still expand a social media presence. If someone has earned a free Starbucks coffee, but receives a tap notification that one of their best friends is closer to a location than they are, that person can transfer their reward as easily as if they were sending a direct message. Considering the miniature screen size, searching for information will also be altered by the popularization of wearable devices. Social media interaction will be vastly different compared to using a computer or a smartphone. Even using Twitter and Vine’s already vastly abbreviated feed system; 164 characters may be too much for someone on the go to fully pay attention to. When creating content for social media, keep all of your messages “bite-sized.” Stick with recognizable tag lines, memorable images, and eye-catching design that will keep anyone’s attention, even on a miniature screen. Wearable technology will certainly experience some growing pains as it becomes more widely used, but it will inevitably change social media channels as we traditionally know them. As the medium changes, the message must change as well. Becoming more involved in location-based advertising will certainly benefit your business when you can no longer reach the consumer with traditional digital media. Giving special offers based on proximity to your business is very important, as well as minimizing your message for your audience. With these practices in place, your business will be able to stay relevant with the changing flow of information.